Electrostatic headphones have been with us for a long time. The Japanese company Stax (not to be confused with the record label) started making stereophonic ES 'phones with the introduction of the SR-1 in 1960 and by the late sixties, Koss was making their flagship model, the ESP-9. I had a pair of these puppies and found them wanting. While Stax was selling a system consisting of a a pair of phones and a combination tube amplifier and a polarizing power supply designed to be fed audio from a line-level input, the Koss ESP-9s had only the power supply. The audio was supplied by one's power amplifier. One connected said amplifier to the Koss box and then connected one's stereo speakers to that box as well. To listen to phones, one interrupted one's feed to the speakers with a switch on the front of the Koss box. Not a great way to power headphones, especially if one was using heavy speaker cables. They would pull the light Koss energizer right off the table. The ESP-9s sounded OK (and I wonder if I would still find that to be the case?) but they were heavy, bulky and with their oil-filled soft vinyl ear cups and closed backs, they would be uncomfortably warm to wear after a while. Meanwhile Stax was making relatively light and comfortable open back ES 'phones, but they were pretty expensive (and still are). Today, Koss makes more headphone models than anyone, including the ESP-950, which is a light, open-backed and comfortable looking electrostatic headphone system. I've never seen a pair in the flesh, but they have good reviews and they are certainly less expensive than most of the competition at $999. I have never been a great fan of headphone listening, preferring instead to do my listening with loudspeakers. Though I've always had several pairs around, I generally used them only when I needed to not disturb others or when mixing a recording. I still have a pair of Koss Pro-4A's for location recording because they are closed-back and have great ear sealing capability. They really attenuate the outside noise and let me concentrate on what's coming in through the microphones. Today, however, headphone listening has become a major mode of listening to music for several generations of music lovers. Spurred, I believe by the fact that most younger listeners get all their music from iPod-like players, pads and smart phones, the industry has seen an explosion of new and old companies producing headphones operating on a number of different principles from the traditional small speaker cone in each earcup to the isodynamic or planar magnetic principle to electrostatics. For many years in the 80's, 90's and two-thousands, if one wanted electrostatic headphones, one pretty much needed to go to Stax or to Koss as they were the only game in town. Today, there are so many electrostatic headphones being made that it's hard to keep track of them. Many new companies have started building this type of 'phone at almost all price points from the low end characterized by Voza and Cybersound with their electret designs (starting around $170), to the Warwick Acoustics Sonoma ES headphone system at at $4995 all the way up to the HiFiMan's $50,000 “Shangra-La” headphone system. We are interested today in a new moderately priced full electrostatic headphone system from HiFiMan called the Jade II. HiFiMan's first product was, in fact, a short-lived ES design called the Jade, but Dr. Fang Bian soon decided to concentrate his efforts on planar magnetic or “isodynamic” designs instead and the original Jades fell by the wayside. About two years ago, the company surprised the industry by introducing a state-of-the-art, cost is no object electrostatic headphone system dubbed the “Shangri-La”. This system came with a huge combination polarizing power supply and tube-based amplifier. The amplifier uses four “Western Electric” 300B tubes (two per channel) and four smaller driver tubes (6SN7s). The 300Bs are directly heated (no separate heater, the filament is the cathode) triodes which were developed in the late 1920's for long-distance telephone amplification and are still prized today by SET fans for their incredibly pure sound. HiFiMan says that there is nothing between the 300Bs and the headphones, no transformers and no capacitors, and thus one hears to pure sound of the these remarkable (and expensive) tubes. Later, and for considerably less ($8000), the company released the “Shangri-La” Jr. Also tube-based, this amplifier used four matched 6SN7s to power the headphones. Now the company has released the very affordable ($2499 US) Jade II electrostatic 'phone system. These phones are all solid state with FETs driving the audio to the 'phones. The Jade II's arrived at my door (from China) in a very large outer box and two smaller inner-boxes. One box contained the headphone set and the other the amplifier/energizer unit. The headset is the by-now familiar HiFiMan roughly anatomical ear shape and has the newer, simpler headband configuration. I.E., the earcups do not swivel right to left as in earlier HiFiMan designs, only back and forth. The first thing one notices about the headphone set is how light it is when compared to HiFiMan's premium planar-magnetic offerings. At less than 13 ounces (365 grams), the Jade II's are among the lightest full-sized 'phones this reviewer has ever tried. This lightness leads to a wearer comfort that allows for multi-hour listening sessions without neck muscles getting stiff! This is a real advantage and when coupled with very comfortable ear pads comprised of a breathable material, it means no ear sweating when listening over a long term as well. The six-foot cord is terminated with the industry-standard five pin plug, which means that if one already has a pair of Stax headphones one can use Jade II's as an extra pair of 'phones with that system's energizer/amplifier. One can also use the headset with the Woo Electrostatic headphone energizer/amplifiers and energizers as well as the iFI “Pro iESL” energizer. 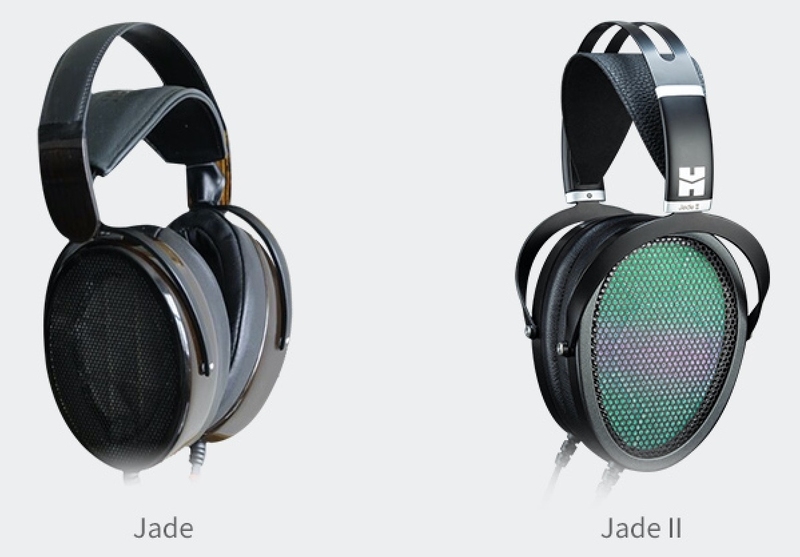 For this reason HiFiMan sells the Jade II headset separately, for $1399. While the Jade II's headset is light, the amplifier/energizer is not. At 14.3 lbs or 6.5 KG, it consists of a black anodized, CNC machined outer surround and an oval inner case nestled inside. The overall measurements are 10.9” X 10.6” X 4.6” (276mm X 270mm X116mm). The amp has two standard electrostatic headphone connectors on the front along with a push-button on-off switch, a push switch to select between balanced and non-balanced inputs and a stepped volume control which controls both pairs of headphone jacks simultaneously. There is no provision for balance between right and left nor are the two output jacks individually adjustable for volume. On the back is an IEC power cable connector and a pair of XLR balanced inputs flanked by a pair of gold-plated unbalanced RCA jacks. As mentioned, the Jade II energizer/amplifier can be connected to one's system by either unbalanced RCAs or via balanced XLRs. Since I have XLR outputs on my DAC (a Schiit Yggdrasil) and there is a definite advantage to having the headphone's controls next to my listening chair (on the other side of the room from the equipment shelves) I decided to use XLRs to connect my system to the Jade II. I have lots of XLR mike cables of different lengths and most are color-coded right and left with red and white tape wrapped around the connector barrels on both ends, so I decided to “borrow” a pair from my recording stash that was long enough to stretch from my DAC around the periphery of my listening room to a table beside my listening chair. All of my digital sources, ranging from the audio stream served from my computer in my office, to Internet radio from my Logitech Squeezebox Touch to CDs and SACDs and audio Blu-Rays played on my Oppo UDP-205 “media center” as well as DAT tapes played on my Otari DAT recorder lead to the Yiggy. This is done to get the most consistent digital sound from all sources. Thus connected, I could play everything (save LPs) into the Jade II amplifier and control the volume from where I sit. The only problem with this scheme is that the Yiggy does not have a remote control (and believe me it needs one! ), but I solved that problem with a broomstick! I found that a broomstick would just reach the Yiggy's source selector button if I leaned forward in my listening chair, so I went to the home depot and bought a length of wooden dowel to use to select which digital input I wanted! I keep it next to my chair at all times. Anyone buying a pair of Jade II's should not expect great sound when you put them on for the first time. Fresh out of the box, the 'phones sound very restricted in dynamic contrasts as well as presenting a fairly narrow soundstage. These phones definitely need about 100 hours of “breaking-in” before sounding their best. The reason for this is that the sound producing element is an extremely thin diaphragm of some proprietary plastic material that is stretched very tightly over the supporting frame between the two perforated stator plates. This diaphragm must stretch a bit to loosen it enough to have the travel necessary to give the best sound. My advice is to turn on a digital radio station and pack the headset in pillows so you don't have to listen to the 'phones as they break-in over four or five days of constant playing. Just let them play for about a week before doing any serious evaluation of their sound. With the Jade II's fully settled-in, the first thing I noticed was the absolute lack of distortion of any kind. Most of us are so used to the types of distortion produced by most transducers, that we don't even think about it. We don't really notice it at all... until it's not there anymore! This is especially true of low frequency distortion, which most of us just take for granted because it is present in greater or lesser extents in virtually all cone based woofers. The Jade II's follow in the general HiFiMan tradition of having great bass extension. HiFiMan's published specs for the Jade II's is that they go down to 7 Hz (although this is without the limits being defined). Irrespective of how many dB down these 'phones are at 7 Hz, in the low 20 Hz region the bass is prodigious for a pair of headphones. More than just the quantity of bass present, the Jade II's have exceptionally clean bass. Listening to Saint-Saens Symphony #3 in C minor, OP78, the “Organ” symphony with Micheal Stern and the Kansas City Symphony (Reference Recordings RR-136), I was struck with not only the power and depth, but the clean delineation of the full C Major chord when the organ sounds-in in the second movement. I know this work well, yet I was still startled by the pedal chord when it started. Even with good subwoofers, capable of shaking the house foundations, I have never heard the organ work in this composition with such authority and cleanliness of presentation. Most headphones tend to double at these frequencies, especially if the low frequency notes are very loud. The Jade II's do not double and maintain a linear pistonic action to the very bottom of whatever is recorded. Transient attacks are what one should expect from a small electrostatic transducer, but rarely hears. I have a recording that I made with a Zoom H6 hand-held recorder using MS microphone module that comes with the recorder. The recording was 24-bit/96 KHz and was made at a local night club. It consisted of solo “flamenco” guitar and an elaborate percussion ensemble. Through my hybrid electrostatic speakers and through my numerous pairs of dynamic headphones, the rim shots on the snare drum are, indeed, impressive, but through the Jade II's they are nothing less than electrifying! The attack is startling and the rim shot stops as quickly as it starts. I have listened to this recording countless times through my HiFiMan “Edition -X, v.2” planar magnetic phones and they didn't have the realistic spped or impact of the Jade II's. I put this down to the ultra thin (less than one micron) diaphragm that HiFiMan employs. This all but massless membrane is able to accelerate and stop much faster than would phones employing more conventional diaphragm materials such as thin Mylar. The Edition X's, I believe, are slowed down by the need to have a current-carrying “voice grid” applied to the diaphragm. So, irrespective of how thin the diaphragm material, there is going to always be the added mass of the voice grid. 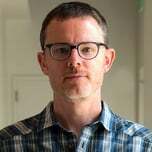 Electrostatic phones' diaphragms, which have a molecule-thick conductive coating “vacuum sputtered” evenly over their entire surface, don't need this extra mass and thus can accelerate and stop much faster. As good as the Jade II's are at the bottom of the audio spectrum, and as good as they are in the transient response department, the 'phones present a basically uncolored midrange as well. Brass instruments sound just right and have the bite one associates with the real thing; something that is rarely present with the best loudspeakers, much less headphones. Also, I have never heard cleaner highs. The advertised Jade II high frequency extension,which is said to reach out to 90 KHz (!) is hardly relevant to the reproduction of music, but it does speak for a smooth and extended treble region, free of the peakiness often encountered with dynamic phones as they reach their high-frequency resonant point. Obviously a headphone system that has response out to 90 KHz is going to have a diaphragm resonance that is way above the audible band pass. Finally, I'd like to comment on soundstage. This may seem like a strange thing to discuss when evaluating headphones because we've all come to expect any imaging produced by a pair of headphones to be inside of our heads. I expected no more or no less when I first donned this pair of Jade II's and to be honest, I was not disappointed. The soundstage was indeed in my head just as I expected. But, after giving them a hundred hours of break-in, I was flabbergasted to find that these phones actually image in a much more speaker-like manner than any headphone set that I had ever experienced before! For the first time the image was outside of my head and in front of me. I realize that it's an illusion, but it is a very satisfying one! If one keeps one's head relatively still, the soundstage that one hears is stable with great image specificity and a wide deep presentation. You'll not be fooled into thinking that you are listening to stereo speakers, But it will be such a breath of fresh air after living with ordinary headphones, that you won't really care. At $2499 (US) there is no doubt that the HiFiMan Jade II electrostatic headphone system is a bargain. The nearest quality electrostatic competitor is the Stax combination of the SR-007A MKII at a bit over $1800 (from Amazon) and the matching Stax SRM-007TA SRM-007TII driver unit/headphone amplifier at slightly more than $1400 (again from Amazon and imported by them directly from Japan as are the headphones) for a grand total of around $3200. Even though this price isn't bad, considering that planar-magnetic units from HiFiMan, Audeze, and others can cost far more than that, Still, the Jade II's modest price is very tempting, especially in light of their stellar performance. Since the Jade II's use the same headset connector as do Stax headphones, if one needs an extension cord, one can purchase the 6 Ft extension for Stax phones, but be advised that such an extension is over a hundred dollars from Amazon. XLR terminated microphone cable is much cheaper and allows one to place one's Jade II system next to one's listening position, obviating the need for an expensive headphone extension. With the introduction of the Jade II electrostatic headphone system from HiFiMan, the performance bar for high quality electrostatic headphones has been raised and simultaneously, the price bar has been lowered. One can spend much more that the $2499 for a pair of magnetic phones that sound nowhere near as good as the Jade II's. Keeping in mind that they won't sound their best until until they have about 100 hours under their belt, one simply cannot go wrong making the HiFiMan Jade II headphones one's next high-end expenditure. Be careful taking a step into the world of electrostatics. It is very addicting. This coming from a BHSE/SR009/Voce owner. It is hard to get close to this level of detail with regular headphones. Very recommended. This setup looks to be very good for half the cost of just the Stax SR009. Nice review Sonis. This makes me want to get a pair of these or at least consider some other electrostatics. I've been looking for new speakers for several months. Recently I've been digging into electrostatic speakers and as of today I'm researching esl headphones. Perhaps going the esl headphone route will work best for me rather than the esl loudspeaker route. Not sure, but I'm looking forward to Axpona and Munich to listen to some of both hopefully. @Soniswith the extension cable. I thought electrostatic hp work by having a high voltage charge between the plates, then the signal modulated on top of that voltage. Been a while but 600V was not uncommon. If microphone cable is used, it’s not designed for this voltage and can easily breakdown. Unless HIFIMAN have made a low voltage version, do you know of the technique? He is using the mic cable terminated XLR for the audio signal to the Energizer. The extension mentioned was a STAX extension cable for the Energizer to headset connection. Wonder where the extension cables are between the energiser and the hp, would need 3m. The connector is much the same on an old Marantz energiser from the mid 1970’s. You are somewhat confused, I’m afraid. If I wasn’t clear in my explanation, I humbly apologize. We are talking about two different types of “extension cables”. The cables that Stax sells on Amazon for more than $100 go between the Jade II amplifier and the headset. It has 5 pins and, indeed carries the polarizing voltage of around 600volts as well as the audio signal. These extensions have the standard Stax pinout as do the HiFiMan Jade II’s. The XLRs to which I referred, on the other hand, carry only audio from my DAC to the input of the Jade II amplifier (it has both balanced (XLR) and unbalanced inputs (RCAs)on the back). I am using XLRs because the cable run from where my equipment is located to where my listening chair is located must, in the name of neatness, follow the walls around the periphery of my room, and is about 25 feet. It is unwise to run unbalanced audio for that long of a run (if, indeed, I had RCA cords that long -which I don’t), so balanced cables are indicated as they can run hundreds of feet without any high frequency roll-off (which RCAs cannot). I hope this clears up any confusion that you might have regarding the two types of “extension cables” that I referenced in my review. Thanks for the post to clear that up, the 2.5m Stax cable for $125 at Amazon was what was in my head. Makes sense to run standard XLR the longer distance, my immediate thought of RCA limitation would be 3m. From where the listening chair is requires the Stax type extension. Would be interesting to compare the Jade 2 to HD800(s). Maybe toward the end the year for that project. New DAC first. Well, I’ve done that comparison. The Jade IIs are far cleaner sounding than the dynamic Sennheiser HD 800s. The Jade 2 is a pretty amazing stat headphone at the asking price. It sounds better with Pro iCan and IESL. When I heard it at my friend's place, it's most impressive attribute is soundstage and imaging. The Susvara and Shangrila Jr beat it in all aspects except for soundstage. I think the Shangrila Sr give you the soundstage/out-of-the-head experience and Susvara's refinement. The biggest draw back of the Jade 2 is the build quality. The cable is just very poor quality and you can't replace it. Personally, I don't see anything wrong with either the build quality of the headphone set in general (that's 'phones and amplifier/energizer) or the headphone cable in particular. A non-detachable cable is this price category is a laugh..
Not with electrostatic Headphones it's not. The cable carries ~600 volts of polarizing voltage and you don't want a detachable cable with that kind of voltage. It could come loose while one is listening and give the listener a nasty shock. The Koss ESP925s don't have detachable cables, neither do any of the Stax ES offerings including their flagship headset, the SR-009S at more than $4000 for the headset alone!. The Sonoma ES 'phones do have a detachable cable as do the Mr. Speakers ES phones, both of which are much more expensive than the Jade IIs, but I wouldn't want either due to to the possibility of shock. BTW, neither of HiFiMan's Shangra-la models, the $50,000 set nor the $8000 set have detachable cords. Believe me, it's not an economic issue with HiFiMan (after all, their cheapest planar magnetic offerings come with detachable cords), it's a safety and liability issue that does not exist with dynamic phones. All it takes is a moment's thought in design. If the headphone had protruding prongs of some sort, and the connecting cable was a female then accidentally detaching the cable leads to no nasty shock. The headphone has no voltage source. The cable has no exposed connectors. You know something like the Stax extension cable design. The headphone side has pins exposed, the powered side is always holes with no protruding metal. One could come up with a more compact connector, but the same ideas would suffice. Well, yes, but that Stax cable is an extension cable. It doesn’t go to the head of the listener, it just extends the length of the headphone cable. I agree with you that safety is very important. So care has to be taken into designing the connector for these higher voltages. Mr. Speakers for instance did and I would use their hp's without hesitation. Actually if it comes to build quality and quality control a lot can be said about Hifiman. A reviewer from Asia actually reported some kind of leakage from Jade II and this was acknowledged by Hifiman. Headphone cables have to deal with a lot of movement during their lifespan and this can create wear and defects, especially close to the connectors. Same as with chargers for smartphones, laptops etc. A detachable cable makes easy replacement possible. And above that, most audiophiles care about experimenting and finetuning with different cables designs....! But that kind of design could safely go to the head of the user. Be sure to check out the Blue Hawaii amp and Jack Woo's latest offering. Both are awesome. I'm looking forward to Axpona and Munich to listen to some of both hopefully. Chris - I invite you to stop by Linear Tube Audio's booth (#8415) at the Ear Gear Expo at AXPONA. We (yes, full disclosure, I work for LTA) will be debuting the Z10e, our first electrostatic headphone amp based on ZOTL technology. Probably not what you're looking for as an entry into the world of electrostatic, given its price, but it might help you understand what all the fuss is about.